Years ago, I had a beauty channel on YouTube. I talked about make-up tipps, the newest launches in the beauty world, the most hideous claims and promises. Let’s face it, in the beauty industry you are allowed to claim really anything. Think about the advertisements in which models are wearing false eyelashes to promote a simple mascara. It’s nonsense, but hey, it sells! That’s why I love reading – honest – beauty reviews. Someone needs to analyze, test and check in depth, if the products really live up to their expectations. After all, a lot of the time they come with pretty impressive price tags. 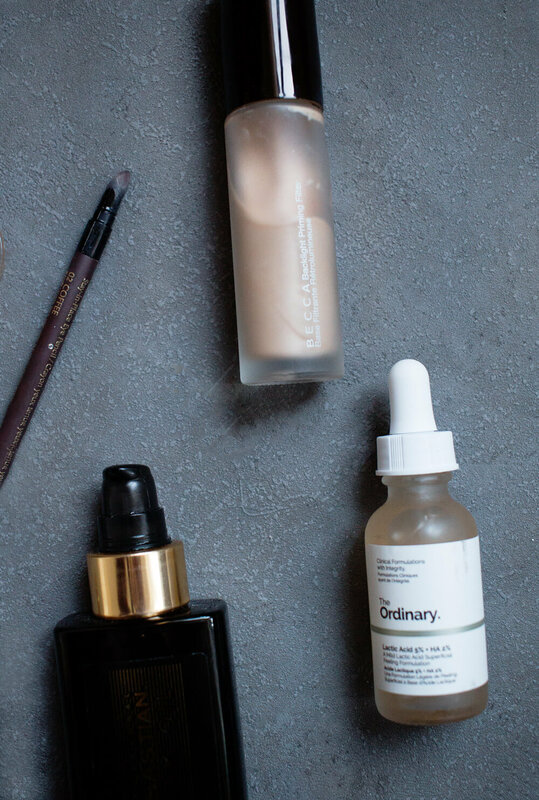 So today I would like to present to you five of my current beauty favorites from The Ordinary, Becca Cosmetics or the H&M beauty line: hair treatments, make-up essentials and skincare. In a future post, I will also talk about my least favorite products. And believe me, I test out quite a bit, because I’m not necessarily blessed with perfect skin (thanks Mum, Dad). Just a little disclaimer at the start: I have bought all of the following products myself. When you think about the brand Becca, most of you will probably immediately associate the famous highlighter named Shimmering Skin Perfector. It’s definitely one of my all-time favorite highlighters, too. But hardly anyone talks about Becca’s make-up primers, which is a shame, because they are so good! In August, I discovered the Backlight Priming Filter and have used it ever since. With my combination skin I struggle with both dry and oily parts. The primer neither dries out my skin, nor does it promote oiliness: A winner! It adds a natural glow in the most subtle way you can imagine. I have read that it even works for very oily skin types. And don’t worry: You can absolutely not detect any glitter particles whatsoever – the picture below proves just that. The best way to describe its look: A transparent, glowy veil allover your skin. If you are searching for a new primer, this is a really good option for many skin types. 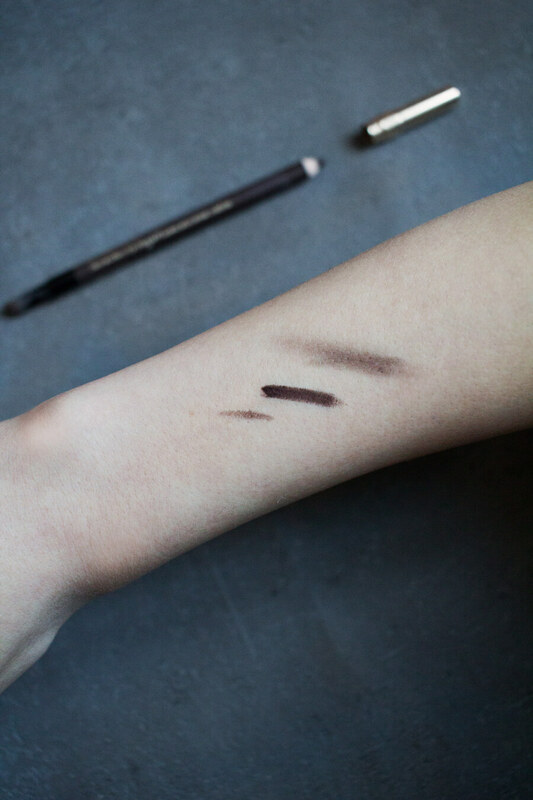 Just like the little black dress is a staple for your wardrobe, a charcoal eyeliner is one of the musthaves for every make-up vanity. However, sometimes I do like a bit of a change. It was love at first sight with the eye pencil out of the Double Wear range of Estee Lauder: Rich color payoff, extremely long wearing and smudge-proof, easy to blend. The color Coffee is a beautiful dark warm brown, suitable for every occasion. It really brings out my green eyes, but I would assume it works on any eye color. I also enjoy the sponge applicator it comes with at the other end of the pencil, as it doesn’t soak up the product (like a brush always does to a certain amount) and blends the color very smoothly. I have to admit: When H&M brought out their new beauty line with new fancy black packaging, I was skeptical. Let’s be honest, the infamous Scandinavian brand was never known for outstanding cosmetics. 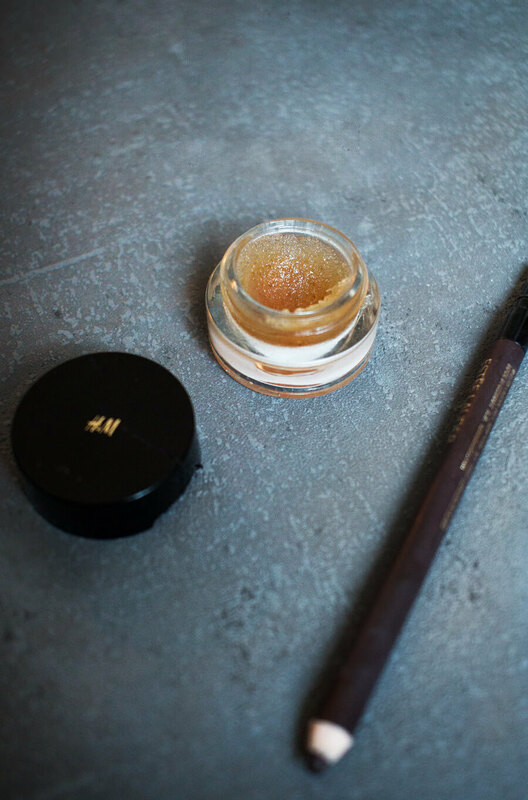 After picking a few items up in the last two months, I found myself constantly reaching out for the H&M Lip Scrub. It’s one of these sugary peelings you put onto the lips, rub it in, then wash it off. I love using this in the morning. Even after you have rinsed off the excess, there is still a good amount of product left on the lips, keeping them soft and moisturized. It is enriched with vitamin e and almond oil, which are amazing skincare ingredients. The only problem I have with this, is actually keeping the stuff on my lips. I swear it tastes like sweet caramel! Not licking it iff within seconds does require some willpower. My favorite topic: skincare. It interests me because unlike make-up, skincare is actually science. There are so many different acids and molecules you can (and should) use. 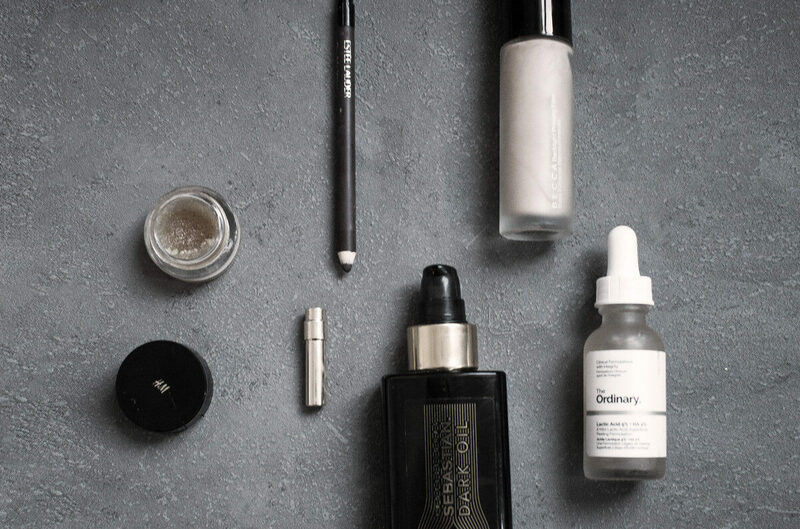 While l was looking for something that evens out my hyperpigmented complexion, I came across The Ordinary, a brand offering multiple skincare products which mainly carry only one or two ingredients, keeping the formula very minimalistic. 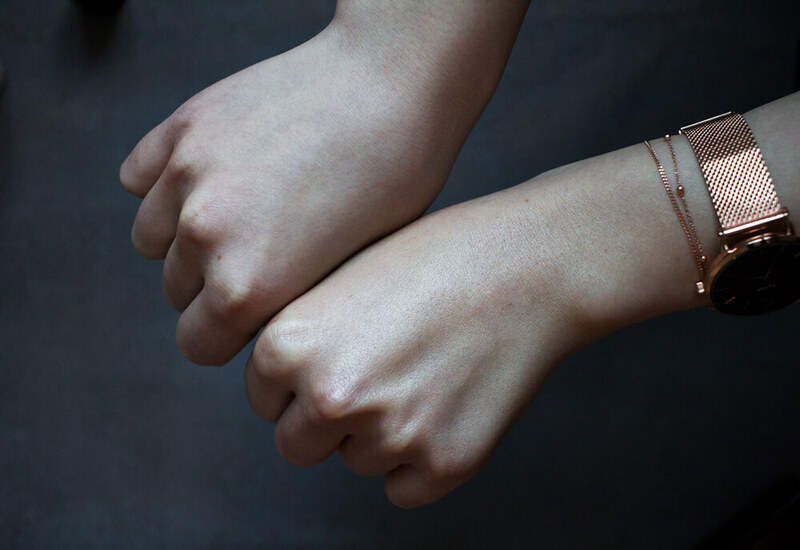 The Ordinary helped to calm down the inflammation tremendously. The one downside for me: It doesn’t seem to help a lot with hyperpigmentation. But still, I would repurchase this immediately! Plus, for skincare products, The Ordinary is pretty cheap. 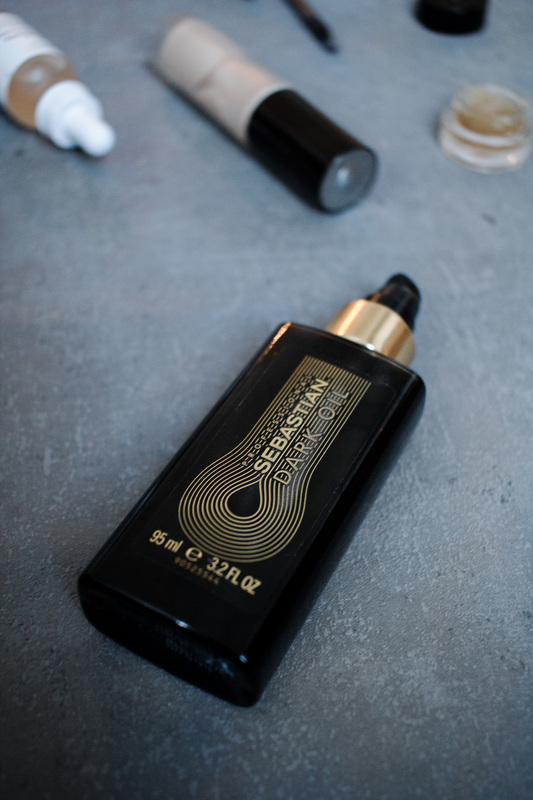 Last time I got my hair cut, the hairdresser used the Sebastian Dark Oil before blowdrying. I never heard of the product or the brand, but was immediately hooked afterwards. Silky and smooth – is that really my hair? It magically turned my frizzy highlighted ends into soft shiny waves. After a few balayage treatments in the past years, I was desperately on the lookout for a miracle product for my dry hair. Well, I have found it! The Dark Oil is basically is a mixture of different kinds of silicones and argan oil. I know, silicones aren’t really popular and trust me, I wouldn’t put that stuff on my scalp either. But when you have extremly frizzy hair that tangles up very easily and a lot of split ends to deal with, silicones really help. It is one of the best hair oils I have used in the past year and that says something! I’m SO excited to try out The Ordinary. I’ve heard great things and I’ve promised myself that I’ll invest heavily in all things skincare related this year. Woohoo, cheers to having great skin and great hair!